The “Baku carpets. New compositions” project has been presented in the Azerbaijan Carpet Museum. The book of the same name was also presented to the guests. The project was implemented by Regional Development Public Association of the Heydar Aliyev Foundation, the Ministry of Culture and Tourism, National Carpet Museum and Zira Culture Centre. The event was attended by Assistant to the First Vice-president of the Republic of Azerbaijan, Executive Director of the Heydar Aliyev Foundation Anar Alakbarov, Head of the Secretariat of the First Vice-President of the Republic of Azerbaijan Altay Hasanov, Azerbaijan Minister of Culture and Tourism Abulfas Garayev, Minister of Taxes Mikayil Jabbarov, chairman of CJSC Azerbaijan Railways Javid Gurbanov, UNWTO Secretary-General Zurab Pololikashvili, prominent public figures, famous representatives of culture and science, creative intelligentsia, and representatives diplomatic missions. Director of the museum Shirin Melikova, speaking at the event, noted that the project is being implemented with the support of First Vice President of Azerbaijan, President of Heydar Aliyev Foundation Mehriban Aliyeva. Speaking about the history of carpet weaving in the country, she spoke of the development of this art at the present time. Noting that the state constantly shows great attention to carpet weaving, Melikova noted that today Azerbaijani carpets are known all over the world. Abulfas Garayev expressed his gratitude to the Heydar Aliyev Foundation, stressing successful implementation of projects in all spheres of culture. 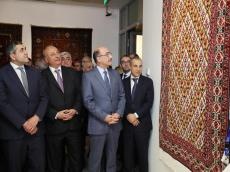 He informed the guests about the transfer of the national carpet "Khatai" dating back to the 17th century to the museum, with the support of the Heydar Aliyev Foundation. “At its own expense, the Foundation carries out work on the return of Azerbaijani carpets to our country, and achieves this. Our culture today is crossing the national birders and is presented in different countries. Numerous tourists come to our country and one of the facilities they are acquainted with is the Carpet Museum,” the minister said. Then event participants viewed the exhibition of new carpets created on the base of the ornaments of ancient carpet weaving art. The exhibition features 29 carpets created on the base of Baku school ornaments. The carpets were created on the basis of historical and ethnographic research, study of carpet-making artists features, technical characteristics and color scale. Azerbaijan folk-applied art and carpet-weaving, occupy a special place in the history of the national culture of the people. There are seven major carpet weaving schools distinguished by patterns, composition, color palette and techniques in Azerbaijan: Baku school, Guba school, Shirvan school, Ganja school, Gazakh school, Karabakh school and Tabriz school. In November 2010, Azerbaijani carpets, unique samples of Azerbaijan's applied art, were included in UNESCO's Representative List of the Intangible Cultural Heritage of Humanity. Baku carpet school covers the villages of the Absheron peninsula and most of the carpets bear the names of the places where they were woven: Goradil, Novkhani, Surakhani, Nardaran, Bulbul, Fatmai, Mardakan, Gala, Mashtaga, Nardaran, Hila, Fyndygan and others. Very often medallions, can be found in the composition of the carpet. The motif of elongated polygons with a stepped outline often contains esoteric symbols, for example the number 4 and eight-pointed star. In more traditional schemes, afshan and kharanga, plants are used. In the stripes of the border, one can find an ornament depicting a running dog, an eagle's beak and cup-shaped leaves. The hook-shaped rhombs can be found. The carpets are fairly loose, the weaving is medium thin. The base is woolen and cotton, while the wool is good and soft to the touch. Moreover, the shuttle is tied with a double thread and knot is symmetrical. The color scheme of carpets includes blue, beige, ivory, yellow, chocolate and red. The exhibition, which aroused great interest of the guests, will last until April 15.